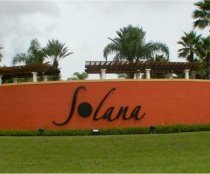 The small gated community of Solana Resort with its lovely Mediterranean coloured villas with pretty red tiled roofs stands out from its surroundings. 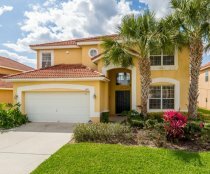 Situated off the US27 and just a few minutes south of US192 or North of the I4, makes Solana Resort only a 20 minute drive to Disney World and 35 minutes to Universal Studios / SeaWorld. Inside the clubhouse there is a fitness room with gym equipment and an internet room with a number of computers which enjoy high speed internet access. These are also available for the free use of villa guests. Also inside the clubhouse is a large social area, a games room with arcade games, a concierge service and a shop serving refreshments. As well as the many shops and restaurants found along US192 there are 2 supermarkets, golf courses, restaurants, fast food outlets, petrol stations and a pharmacy all situated along the US27 all within 5 - 10 minutes drive away. Attractive 6 bedroom 5.5 bathroom villa offering the opportunity for your family to have a comfortable and enjoyable holiday. 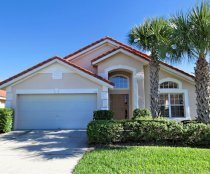 Our home features a huge private sparkling west facing pool with spa, family room with huge LCD cable TV, DVD & PlayStation, games room with pool table & table tennis, wireless high-speed internet access, and LCD cable TV's in all bedrooms. Luxury 4 bedroom 3 bathroom single storey villa with large east facing swimming pool and spa with no rear neighbours. Watch the Disney fireworks from our pool deck. The villa is attractively furnished and well equipped including 55" LCD cable TV / DVD, LCD cable TV's in all bedrooms, games room, baby equipment, and high-speed DSL WiFi internet access throughout the villa & poolside.